She didn't know who she was. She didn't know where she was. She didn't know why she was being chased. All she knew was that she was able to do things she shouldn't be able to do. Run faster than possible. She didn't know why she was compelled to go where she headed, but was learning to trust her instincts. Ethan had escaped The Farm where he and others like him had been brought and trained. Not raised as a child should be, but trained and brainwashed to become puppets to those who now hunted him. Now, someone had found him. A vampire like him, but which kind was she? One dedicated to the DPI? Or a Wildborn who hated Bloodliners such as he? Or a Bloodliner determined to bring him back. Then he saw her. Lilith. And he had more questions than answers. Together they would have to evade those hunting them. Ethan had wanted to return for Lilith, but now that she was here, with him, he had no intention of returning. It would be a suicide mission - rescuing people who would just as soon kill them. Lilith, however, couldn't leave the innocent behind. They would have to determine who was friend, who was foe, and even whether or not they could trust one another. 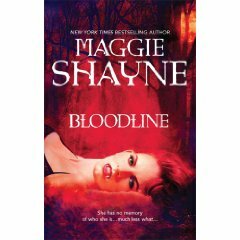 Bloodline was another thrilling read in Maggie Shayne's Wings in the Night series. Readers could easily empathize with both Ethan and Lilith's opposing views. Ethan wanted to protect Lilith and stay away from people who he believed would not want their help, whereas Lilith believed that they could all be saved and wanted to be rescued. We also learn more about the fascinating inner workings of the Sisterhood of Athena, the secret society who protects the paranormals.